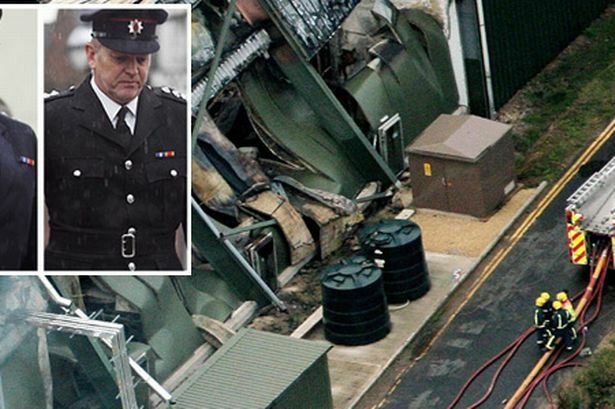 Two firefighters have been cleared of the manslaughter of four of their colleagues who died in a warehouse blaze in 2007. A jury at Stafford Crown Court took just over seven hours to acquit Station Manager Timothy Woodward and Watch Manager Adrian Ashley after hearing six weeks of evidence about the deaths of Ashley Stephens, Darren Yates-Badley, John Averis and Ian Reid. The prosecution had alleged that Mr Woodward and Mr Ashley, who acted as incident commanders during the blaze in Atherstone-on-Stour, Warwickshire, were criminally responsible for the "needless" deaths of the four-man breathing apparatus crew. But jurors decided that Mr Woodward, 51, and Mr Ashley, 45, had not acted illegally during their command of the incident on the evening of November 2 2007. Mr Woodward, from Leamington Spa, and Mr Ashley, from Nuneaton, were charged with gross negligence manslaughter in February last year following a criminal inquiry which cost taxpayers £4.6 million. A third defendant, 50-year-old Watch Manager Paul Simmons, was acquitted of manslaughter on the directions of the judge part-way through the trial. The Crown had alleged that Mr Ashley breached his duty of care to those who were killed by "exposing them to substantial risk to life when no other lives were at risk". Mr Woodward was alleged to have breached his duty of care to the four by failing to end the deployment of colleagues wearing breathing apparatus for the purpose of "offensive" firefighting. The Fire Brigades Union (FBU) hit out at police and prosecutors after the two remaining firefighters were cleared. The union said it was absurd that the arsonists who started the blaze had never faced trial, while those who struggled to put it out were "relentlessly pursued" by police and the CPS. FBU assistant general secretary Andy Dark said: "This was the first time firefighters at an incident were accused of the manslaughter of their colleagues. "This prosecution cast a shadow across the whole fire service and caused anger and concern. "We are relieved at the not-guilty verdicts but firefighters are furious at the police and prosecutors. "The criminals who started the fire are still free, but those who tried to put the fire out were arrested, charged and brought to trial."